Mark and I (Matt) were privileged to attend the OSU College of Social Work Scholarship Dinner earlier this week. The dinner celebrates the field of social work and recognizes students at OSU who are pursuing a Master’s Degree in Social Work. The Joseph R. Palmer Memorial Scholarship is given each year to a student at the College who demonstrates a strong commitment to the profession and desires to integrate their faith with their work in serving others. This year’s recipient is Rachel Mack (pictured with us below), a young woman from Westerville who plans on working with immigrants after her graduation. From left to right: Mark Palmer, Rachel Mack, and Matt Palmer. 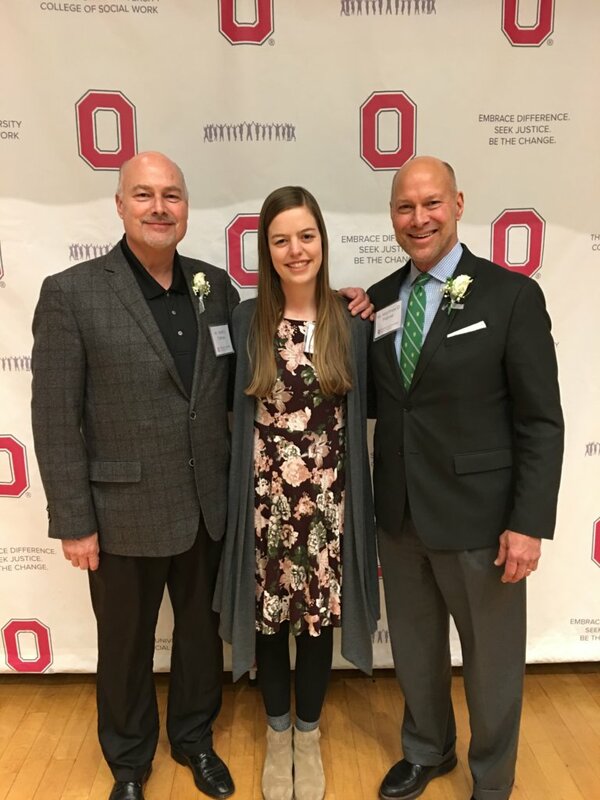 This summer Rachel will be interning with the State of Ohio Department of Rehabilitation and Corrections, the very department that our father (for whom her scholarship is named) worked for throughout much of his career in social work. We are blessed to make a contribution to his scholarship each year – it is just one way that we remember his remarkable career and strive to help others that have a similar career of service to others. What other ways can all of us remember loved ones and their remarkable lives? Acts of love and service done in memory or honor of loved ones can have a profound impact – on us and on others. Who in your life can you remember and honor? And how can you best remember and honor them – perhaps a scholarship, but much more than that – your daily acts of love and service. Great lives – we live them one day at a time – in all the little things that we do and say. Today, let’s recommit to living great lives – the greatness of service, of love, of care for those around us. And in living great lives, we will build a great world.